Tabata – My Favorite Workout – What Is It? Looking for a quick, high intensity workout? Tabata may be your answer. The gym at my office started offering Tabata classes last year, and they have grown to be my favorite. But what is Tabata? Tabata training is a high-intensity interval training (HIIT) workout, featuring exercise intervals that last just 20 seconds. HIIT workouts have been one of the fastest growing trends in the exercise world, due to their calorie burning potential in a short time. You push yourself as hard as you can for 20 seconds and rest for 10 seconds. This is one set. You’ll complete eight sets of each exercise. You can do pretty much any exercise you wish. You can do squats, push-ups, burpees or any other exercise that works your large muscle groups. My office gym even has Tabata classes with core and cardio focuses. The best part is that the total class lasts only 20 minutes! 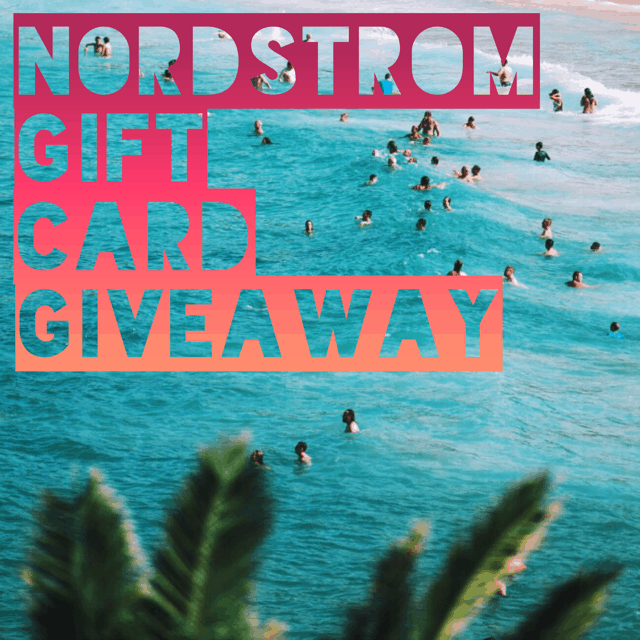 Unless you’ve been living under a rock, you’ve probably heard that the Nordstrom Anniversary Sale is currently going on through August 6. If you’re needing a little fitness inspiration, sometimes a new outfit can be that motivation. Whether you can’t wait to show it off or set yourself a goal to buy something new if you workout so many times or reach a certain goal. I’ll share some of my favorite pieces from the sale. I love Zella leggings! And even at full price, this Nordstrom-exclusive brand only averages about $54. This pair of ‘Hatha’ High Waist Crop Leggings is currently on sale for as low as $33.90. There is also a pair of full length Live In High Waist Leggings on sale for $35.90. While I’ve never tried Zella’s tops, there are both tanks and tops included in the sale. Check out the Pace Tank ($24.90) and ‘Siesta’ Studio Tee ($29.90). The Nike Free Focus Flyknit 2 Training Shoe is a popular choice for hitting the gym, lifting weights, and attending group classes. On sale for $89.90. I love a good running short, and the Dry Tempo Running Shorts ($22.90) have mesh side panels for extra cooling power. Definitely needed this time of year! And if you like that old-school sporty sweats look and feel, the Sportswear Gym Capris ($37.90) are just what you need. Rules: Use the Rafflecopter form to enter daily. Giveaway ends 8/18 and is open worldwide. Winner will be notified via email. In St Louis City, Paul Hamilton (owner of Eleven Eleven Mississippi, Vin de Set, PW Pizza, The Malt House Cellar, Grand Petite Market, and 21st Street Brewers Bar) has started a Tower to Table dinner program featuring a tour of Hamilton Farms (and their 61 Tower Farms) with dinner at either Eleven Eleven Mississippi or Vin de Set. I was able to attend this past week with dinner at Eleven Eleven Mississippi. The tour was held at Hamilton Farms located on Chouteau Ave in St Louis city, across the street from the building housing PW Pizza, Vin de Set, and Grand Petite Market. This is an urban setting just south of downtown St Louis. Walking in, there are Tower Gardens lining both walls in 2 rows each, for a total of 61 towers. The middle area is the farmer’s work area, where he had some seedlings started for future growing in the towers. Hamilton Farms also includes a traditional garden across the street where they grow tomatoes, carrots, and other root vegetables. They also have a beehive and chickens on the farm to provide fresh produce, eggs, and honey to their restaurants and brewery. Hamilton Farms employs one farmer, who led our tour and explained how the aeroponic towers worked. The Tower Farms used by Hamilton Farms are very similar to the Tower Gardens available residentially, except the Tower Farms have 11 pods, which can hold a total of 44 plants per tower. Tower Gardens can hold 7 pods, for a total of 28 plants per tower. The Tower Farms are also able to be connected to a water source for continual replenishment of the basin. The towers at Hamilton Farms were currently growing peppers, kale, lemongrass, lemon bomb, basil, and various lettuces. With the aeroponic growing system, there is no soil for weeds to grow and plants can grow all year within the greenhouse. The plants in the Tower Farms also grow quicker and larger than traditionally grown plants. When we arrived at Eleven Eleven Mississippi, they had our table ready with menus for the evening tucked into our napkins. Dinner was paired with an optional 2 course wine pairing. We started with the Goat Cheese Stuffed Banana Pepper over a bed of garden greens, candied walnuts and a basil vinaigrette. I would not normally eat peppers, but I decided to at least try everything on the menu. I ended up eating the entire pepper. It was a great little starter, similar to a salad course. The second course was a Hickory Smoked Salmon with sauteed sorrel, patty pan squash, grilled fennel, with a lemon drop-champagne butter. This was my favorite course! Sauteed sorrel was very similar to a sauteed spinach or kale. The farmer on the tour had forewarned us that lemon drop was going to be used in the evening’s meal and that it’s commonly used to numb the mouth. Fortunately, we did not encounter any numbing of the mouth. The third course was a Roasted Duck Breast with russian blue potato puree, wilted tuscan kale, sun gold tomato-mint relist and pomegranate molasses. Again, tomatoes are not a vegetable that I have learned to like, but I did try it. They were very sweet, and one did the trick for me. The potato puree tasted like mashed potatoes blended until very smooth. Overall, a very delicious dish. I would highly recommend the Tower to Table dinner and tour to anyone in or visiting St Louis. It’s very reasonably priced, and you get very high quality food. Tower To Table Dinners will be offered at Vin de Set August 2nd and September 6th. Limited space available. Reservations are required. Please call 314-241-8989. They will also be offered at Eleven Eleven Mississippi August 16th and September 20th. Limited space available. Reservations are required. Please call 314-241-9999. Aeroponic Tower Garden Tour (optional) 6pm located at 2101 Chouteau Ave, dinner 6:45 pm, three- course dinner $29.99 plus tax & gratuity. Optional two-course wine pairing $11.99 plus tax & gratuity. We have 3 Tower Gardens growing at our home right now. They are full of green beans, kale, cauliflower, zucchini, tomatoes, strawberries, brussel sprouts, parsley, and marigolds. They are really easy to care for, only requiring upkeep about once a week to refill the water. As mentioned above, there is no weeding! The towers run on a timer where they get water pumped up to the roots for 15 minutes, then rest for 15-45 minutes depending on the heat and type of plants. You can find out more at the Tower Garden website. I’ve made it to Day #4. By Thursday I am usually running out of healthy snacks and feeling deprived by the afternoon, but I’ve been full and satisfied this week. I switched up when I drink my shakes for this round of the Shred10 and I think that’s made a ton of difference in keeping me full in the afternoon. I usually drink both shakes in the morning or have 1 in the morning and 1 in the afternoon, but this week I haven’t started my shakes until the afternoon. This does usually leave me finishing up after 6pm, but I’d prefer missing that guideline than eating something unhealthy because I’m starving. I enjoyed 2 scrambled eggs with a slice of bacon from the office cafeteria this morning for breakfast. Quick and easy protein! As you know from Day #2, I have a real weakness for Chinese food. The special in the cafeteria was sweet n sour chicken with rice and a bottle of water. I had prepped my 2 shakes again at home before leaving for work. Craving some chocolate mid-afternoon, the Chocolate Complete shake just hit the spot. Unsweetened almond milk, chia seeds, and Chocolate Complete, shaken until smooth. Perfect treat! I made a simple dinner of salmon and arborio rice. Looks pretty plain, but pretty tasty. After dinner, I finished my shake that I hadn’t finished in the afternoon. Blogging has been keeping me up late at night, so I missed my sleep goal today, but I’m working on the blog earlier today, so hopefully I can catch up tomorrow. I also met my step goal! I use my Garmin’s autoadjusting goal, so when I meet my goal, my step goal for the next day goes up, and when I miss the goal, it goes down. I did a little better with my water today, but still short of my goal. I definitely attribute my blog to helping me be more accountable during this Shred10. I’m not perfect, but I feel the shred is a great tool to make you more aware of your food choices. There is always room for improvement, but without tracking my choices, I know that I wouldn’t be doing as well as I am. It’s Day #3 of Shred10. This is usually the day when most people start feeling the detox and may actually feel a little sick. I’ve felt pretty good so far, and have actually been feel full on less food than usual. Here’s the recap of the Shred10 guidelines I am following. This morning, I blended together unsweetened almond milk, strawberries, blackberries, and chia seeds with some ice for a refreshing smoothie. I had to take my son to the dentist this morning, so we stopped at Qdoba on the way home. I ordered the burrito bowl with brown rice, black beans, adobo chicken, salsa verde, and lettuce. It had been a long time since I was last at Qdoba, and they’ve added quite a few options to their menu. Many of which are quite healthy. Working from home today, my son wanted to make a smoothie with all the fruit we had on hand. So we blended unsweetened almond milk with Dutch Chocolate Juice Plus+ Complete, strawberries, chia seeds, blackberries, blueberries, and a whole banana. My son didn’t drink much of his smoothie, so I saved his for later and drank it after our Family Fitness Night. I’m president of my church’s Ladies Club and we hosted a Family Fitness Night tonight at a local park. I led the kids in a warm up, helped demonstrate the obstacle course, and ran a game of nutrition red light green light. Instead of yelling red light or green light, I would shout out a healthy green light food or an unhealthy red light food. The kids had a fun time learning about new vegetables. We also led the kids through a yoga story through the jungle and handed out jump ropes, bananas and apples. Even less water today. Something I need to focus on for sure. I met the 7 hour sleep goal again, but fell way short of my step goal. Working from home really takes me off my feet as I work at a large campus that requires a bit of walking to get to/from parking and around for meetings. Nutritionally, I did pretty good today. Ate healthy meals, with lots of fruit. It’s tough to finish all meals before 6pm with a busy family and working full-time, but the key is to try and eat early enough that your body has time to start digestion. My focus tomorrow is WATER! Thanks for following along with me to Day #2 of the 10 day Shred10. Let’s review the guidelines I’m following. I finished off the Mango-chia overnight oatmeal that I had started on Day #1. Still delicious on Day #2. I’ll be trying out different variations of this recipe including strawberries and whatever fruit I can find fresh. I also took my Juice Plus+ trio capsules, Juice Plus+ omega, and Doterra probiotic and TriEase. I made it to the gym today! My first time in weeks. I attended a 30 minute Strength class at my office gym. It included 3 groups of 4 exercises that we completed twice for 45 seconds per exercise. Having not been to class in awhile, I chose a lighter weight (8 pounds). The exercises ranged from bicep curls with an overhead press and tricep dip to various ab work like planks. Definitely a great work out! My weakness at work is when the Lulu Dim Sum truck comes to campus. I love their General Tso Chicken! I splurged, after just working out, and ordered the General Tso, but with green beans instead of rice. Even though I’m not perfect with the Shred10, I love how it makes me aware of my food choices. I chose a vegetable instead of a starch. I then spent my lunch hour googling the ingredients in General Tso, what is gluten free, and what is considered processed food. The traditional General Tso sauce recipe includes sugar and soy sauce (which may or may not be gluten free). But I did learn that the chicken is battered in cornstarch, which is gluten free. I had several meetings this afternoon, leaving me to start my double shake at 4pm. I took a break when I got home from work and didn’t finish it off until 9pm. So, I missed that 6pm cutoff, but just didn’t feel hungry. Again, I had made my shake in the morning with just Dutch Chocolate Juice Plus+ Complete, unsweetened almond milk, and chia seeds. I throw everything in my shaker bottle, shake, and refrigerate until I’m ready to drink. I met the 7 hours of sleep goal, and fell a little short of my step goal, but I did get in that exercise as mentioned earlier. Fell much shorter on my water goal today. I do pretty well at work, but seem to stop drinking water when I get home. I have the same water bottle at work and home, so need to work on keeping it within arms reach, especially as I’m sitting at the computer working on my blog and social media posts. Today was much tougher than Day #1. Having the accountability of this blog did make me choose a healthier option at lunch than I would have otherwise, but nearly every aspect will use some special attention tomorrow, especially as I am working from home and won’t get the movement around the office. Missed Day #1? Catch it here. Shred10 Day #1 – How Did I Do? Over the next 10 days, I’ll be following the guidelines of the Shred10 program and sharing my journey here. What aspect of the program would be most difficult for you? For me, exercise will be a challenge since my husband is out of town and I have 2 small children. I also struggle to drink enough water, so I’ll be focusing on that aspect as well. I prepared the Mango-chia overnight oatmeal from Sun Basket Sunday evening in preparation for Shred10 starting on Monday. The recipe used almond milk and gluten free oats, making it fit the Shred10 guidelines, and honey is any acceptable sweetener too. The recipe made 2 servings (picture shown is 2 servings – filling 1 pint sized mason jar). I also started my day with the Juice Plus+ trio and Omega blend. I love how easy it is to get 30 fruits and vegetables, and start my day off nutritionally sound. I also take the Doterra probiotic and TriEase, as seasonal allergens are on high right now in St Louis. I’m lucky to have access to an amazing cafeteria at work, with lots of healthy options. Today, I went with the salad bar and choose mixed greens with mushrooms, egg, broccoli, grilled chicken, and sunflower seeds. It was hard for me to stay away from the cheese and roll, but I did it! I started drinking my 2 shakes around 3pm and continued working on them until the 6pm cutoff, counting as a snack and my dinner. I made my shakes at home before work and left in the fridge during the day. My favorite preparation is to shake the Juice Plus+ Complete powder with unsweetened almond milk and chia seeds. The chia seeds take on some of the milk and make the shake more like a milk shake. Delicious! I drank 60 oz, just short of my 70 oz goal. I like the Hydra Coach app to track my water. It breaks down your goal during the day, so you can see if you’re on track and will give you notifications if you’re falling behind. I use my Garmin Vivoactive to track my sleep and steps. I did very good on sleep, going to bed early Sunday night. But fell short of my step goal and didn’t do any organized fitness activity. Day #1 went pretty well, just need to find a way to add more movement during the day. Thursday evening, my friend Sherry hosted a Taste of the Shred event, to highlight food that is approved during Shred10 (see my post here for more information on the Shred10 program). She asked each guest to bring a dish that fulfilled the Shred10 guidelines of no dairy, no gluten, no added sugars, no caffeine, no processed foods, and no alcohol. We had a large spread of fresh fruits, vegetables, and prepared dishes. As people gathered, we snacked on hummus with gluten-free crackers and asparagus, and grapes. Sherry had prepared a beautiful lemon-lime infused water, along with a decaf peppermint tea. Many children were in attendance as well, and they enjoyed snacking on the Juice Plus+ gummy chewables. One of my favorite dishes was a mixed greens salad with a variety of toppings to choose from, including peas, sunflower seeds, mushrooms, white beans, tomatoes, walnuts and radishes. Sherry also made a home made dressing of vinegar, olive oil and honey. Most store bought dressings have added sugars, which we are avoiding during the Shred10. If you haven’t tried making your own dressing yet, it’s very easy. Sherry learned her recipe directly from the White House chef and it is delicious. Other popular dishes were a butternut squash dish baked with onions and tomatoes, a Mexican fruit salad (recipe here) and Chocolate Complete Energy Balls. Juice Plus+ Chocolate Complete can be purchased here. After enjoying dinner, we all went around the table introducing ourselves and sharing our health goals. Many people were looking for improved health and more energy. It was a great variety of guests and an event that we plan to host monthly during the week prior to each new Shred10. Stay tuned for my posts sharing my journey on this month’s shred. Is your health exactly where you want it to be? What if you could learn about tools to take your health back? That’s why I’m so excited to have found the Healthy Living Revolution and the tools it provides for 10 day jumpstarts and overall nutrition guidance. Healthy used to be SIMPLE! It wasn’t the latest superfood or the new diet craze. Healthy was fresh vegetables from grandma’s garden. Kids played outside until it was dark. You drank water straight from a hose. We had energy all day long and 70% of us weren’t on medications. Healthy was a lifestyle that we lived and we can again. This Healthy Living Revolution is about taking our health back, our families’ health back, our schools health back, our country’s health back. Part of the reason we need to #takehealthyback isn’t something that we can easily control. In our world today we are exposed to toxic chemicals that are putting our health at risk. Many of the health challenges and diseases that we are facing can be linked to these toxins. Silent Spring researchers found that BPA and other toxins could be reduced significantly after just 3 days by eating whole foods! Fruits and vegetables are powerful not just because they detox us but because they contain ANTIOXIDANTS. Antioxidants reduce oxidative stress which causes aging and disease. They also contain thousands of phytonutrients – plant nutrients! These phytonutrients prevent cancer and other diseases. The second image shows a list of 400 ingredients in an apple but scientists believe there are probably 10,000 or more ingredients yet to be discovered. All of these ingredients create synergy which means they work together to prevent disease. An isolated supplement or multivitamin has maybe 20 ingredients. We need ALL of those thousands of ingredients in fruits and vegetables every day. WE DON’T HAVE A VITAMIN DEFICIENCY WE HAVE A FRUIT AND VEGETABLE DEFICIENCY. I loved learning this!!!! And not only are we eating fewer fruits and vegetables, but the mass produced produce that many of us find in the grocery store is packing less nutritional punch than just 2 generations ago. According to Tim Lang, a professor at the Centre for Food Policy in London, you would have to eat 8 oranges to get the same amount of vitamin A your grandparents got from a single orange. And you would need to EAT FIVE to get the same level of iron. Can you imagine FLOODING YOUR BODY with 45 whole foods daily? We found a way to do this. It’s called Juice Plus+! Juice Plus+ is 30 raw, vine-ripened fruits, veggies and berries in capsules or chewables. It’s juicing made easy! The Juice Plus+ Complete is a powdered shake mix that can be blended with plant milk or even water. It’s low fat, low sugar, low glycemic, gluten free, vegan and 100% NON-GMO plants. It has 13 grams of Protein, 8 grams of fiber and wonderful ingredients. And the JP Complete is delicious! This image shows us why counting calories and even exercising without proper nutrition can do more harm than good. Look at the top portion. When you diet and exercise without proper nutrition, it causes stress to your body. You burn fat but toxins are exposed that have no way to get out of your system because there is lack of good nutrition to help cleanse the toxins while losing that fat. This will make you feel worse because it creates a rebound effect. In an effort to self-protect, your body will increase fat production to protect your vital organs. You can see why dieting is a vicious cycle! Now look at the bottom portion. FLOODING YOUR BODY with fruits and veggies every day will help your liver convert these toxins into something that can be carried out of the body. Did you know that willpower is a function of blood sugar? Think about a time when you skipped a meal or you were too busy that you just forgot to eat. We all have those days, right? And then you want to eat anything in site 🙂 Here is why. Will power is a function of blood sugar. Normally our blood sugar will fluctuate after every meal when we eat one without crunchy raw veggies which is represented by the light blue graph below. Crackers, bread, soda, box cereals, soup, baked goods, alcohol, dessert and candy; all these will suddenly raise our blood sugar and then there is a drastic dip that follows. Or we may skip a meal and our blood sugar drops and we then have no self-control. This also happens first thing in the morning when we wake up on an empty stomach and even though we might not feel hungry our blood sugar is very low and we are convinced we need caffeine to wake up. A great way to jumpstart your health and implement the concepts we’ve just covered is the Shred10 program! We have a free Shred10 Guidebook available that includes Q&A from experts, Recipes, Shred friendly options for meal planning, nutrition shake recipes and more! We also have a Facebook group that includes a dedicated group of individuals all doing the Shred together at the same time to help keep each other accountable and committed. The next Shred is starting Monday, June 5 with new Shred groups forming the first Monday of every month. The Shred10 is not a fad diet, it is a jumpstart into lifelong health. The final way to be part of the Healthy Living Revolution is to be part of our Healthy Living Community. Our hope is that your experience in our community is filled with positive engagement, encouragement and on-going education. A free cookbook that you can download! LIVE Events, which will be in person and online to reach everyone, no matter where they are. Continuing education from a variety of healthcare and fitness professionals. If I gave you $2.38 to buy produce at the grocery store how much do you think you could buy? Maybe one organic orange and one apple? That’s what I love about JP+! I know some of you would like to get started so here is the pricing! And one great thing I haven’t mentioned yet, children are FREE! Ask me for more information. No additional cost for the Shred10 program! P.S. Make sure to subscribe to my blog to follow along as I document my June Shred10 experience. Email sign-up is in the right side bar or follow me on Facebook. Follow all of your favorite blogs in one place with Bloglovin’. Lots of bloggers turned to it after the demise of Google Reader. When you create an account there, you can follow any blogger on any platform, whether or not they’re also signed up. Then, you can log in and see the latest posts from all the blogs you follow in one spot. There’s also an app, so you can catch up with your reading on the go.